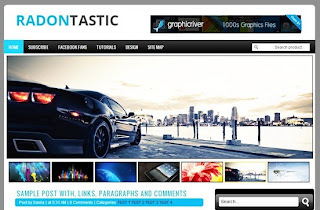 Radontastic Blogger Template is a free blogger template adapted from WordPress. It is of 2 Column and is a SEO and Widget Ready Template. It has Footer Column also the Sidebar column. It has features like 3 Column, Auto Readmore, Top Navigation Bar, Slideshow, Footer Columns, No Sidebar, Fixed Width, Ads Ready, SEO Ready, Widget Ready, Magazine etc. just edit the “Slider” widget, and add images like below format and you can add unlimited images. 3. After this you see a Unordered Links list and Customize it! the sidebar is not visible in page elements. After adding the Sidebar Widgets Again place the above code.